First, beware. The trip is 12 hours long. In defense of our guide, it can't be much shorter than this, but all riders need to know. This trip has majestic views and incredible sights, but our tour guide spent more time telling us about sites than allowing us to explore. We now know about every type of ginger that grows in Hawaii, as well as lots of other flora and fauna, but often the most spectacular sites were a drive by. We did spend 45 minutes at the black sand beach. Incredible...even I a rain storm. The kids swam and we took in the views. Our guide was really skiddish about us doing anything off the beaten path. We had to be escorted around each site, which seemed like overkill for adults that knew better. Also, god bless him, but the jokes get old after about an hour,much less twelve. At about hour 9, I think we all had enough of each other. He was punchy, we were punchy, it was just a long day. Trip would be great for elderly folks that enjoy seeing sights through the van window. La excursion a Hana es muy aburrida. Son muchas horas viajando en una van para ver 2 cascadas (waterfall) y una playa de arenas negras. No vale la pena perder un dia de vacaciones y muchos pesos para pasar el dia arriba de un transfer, el cual estaba bastante sucio y era muy incomodo. La comida (dos sandwichs) uno de desayuno y otro de almuerzo fueron vergonzozos para el valor del tour. Jake, our Tour Guide was great!! He made the trip educational. Best, scariest trip ever! To be repeated. My husband and I were in Maui on our honeymoon a few days ago. I was in Maui with my family a few years back and we drove the road to Hana without a tour guide. I decided to book the tour because driving the road was dangerous and I wanted to be able to relax with my husband. We also booked this specific tour because it guaranteed we would stop at all the beautiful locations. However, that did not happen. Our tour guide was extremely nice, friendly, and knowledgeable but we did not stop at any of the locations promised except the black sand beach. 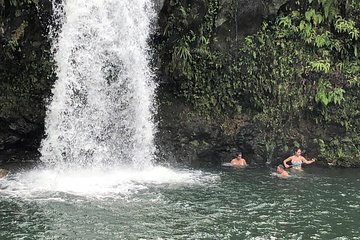 We skipped over twin falls, garden of eden, seven sacred pools, and the red sand beach. We only got 30 minutes to explore the park that the black sand beach was in, which was not nearly enough time. We didn’t even have a chance to see the lava tubes. We also stopped at Charles Lindbergh’s grave, which we could have skipped. Everyone else on the tour seemed to be frustrated that we skipped over everything that was promised to us. For $145 per person, I would definitely not recommend this tour. It was a scam. Full day of unforgettable adventure. Our driver was very knowledgeable and made stops I'd never been to and this is probably my 6th trip. I always take a tour for the history, comfort and ability to just enjoy the scenery. The tour had a very comfortable ride, We saw everything they promised and more. Drinking water was provided at any time..
Our driver/guide was the best...answered questions, was kind, honorable and so very careful. I didn't know how to spell his name..Jays or Jaz? I am so glad we didn't try to drive it ourselves! If it wasn't for the poor customer service we received from one of the Tour Company's phone operators, it would definitely be 5 stars! However, the actual tour was AMAZING! We were very lucky as a party of 2 being able to get a private tour! Perfect way to see the Road to Hana! Unless you're 100 confident to drive it, I would suggest booking the tour simply for ease of mind - and to obviously soak in all the beautiful scenery!